The magical attribute of butternut squash is its inherent sweetness. When roasted, butternut squash’s natural sugars caramelize, intensifying its flavor, and turning this humble vegetable into something sublime. The sage leaves and unpeeled garlic cloves that are roasted along with the squash slices bring additional layers of flavor to this otherwise unfussy dish. 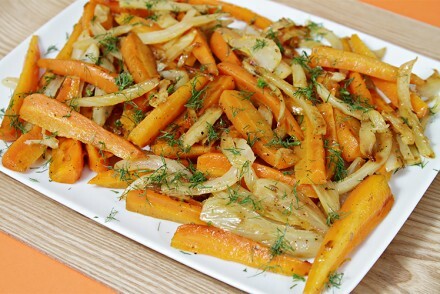 Serve the slices as a side vegetable, or use them in lieu of the fennel-roasted apples in this autumn harvest salad. Either way, butternut squash is one of those vegetables that make you look forward to winter’s flavors. Step 1: Place the butternut squash slices in the center of the pan. Sprinkle with the sage, garlic, salt and pepper. Drizzle with the olive oil and toss well. 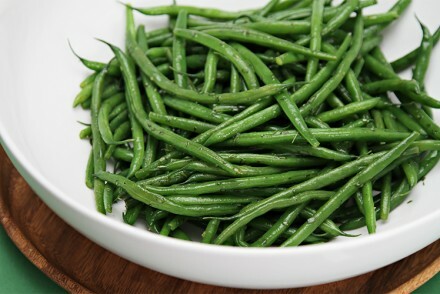 Arrange slices in a singe layer, tucking the sage and garlic in between the slices, and bake for 20 minutes. Step 2: Remove from oven, carefully flip each slice so as not to break them. Return to oven and bake for 8 to 10 minutes, until golden-brown at the edges. Remove garlic cloves and discard. Place the slices on a serving tray. 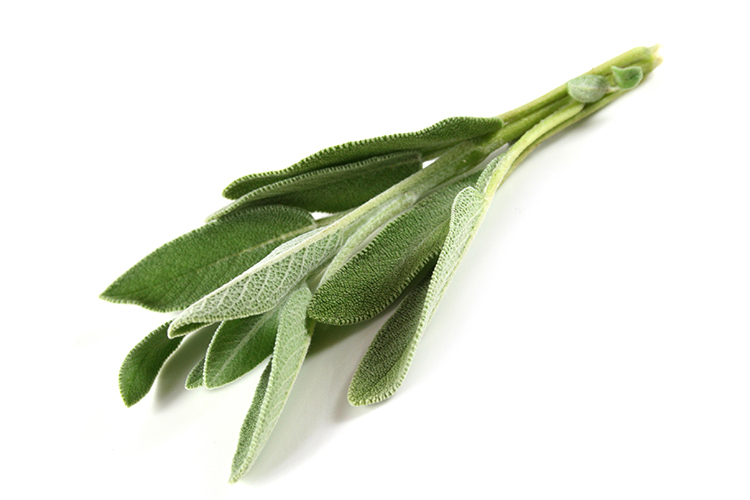 Garnish with the sage leaves and serve immediately. Cook’s note: The squash can be sliced up to 24 hours ahead and refrigerated in Ziploc bags. Bake up to 6 hours ahead and reheat at 450ºF (230ºC) for 4 to 5 minutes until hot. Butternut Squash needs VERY LITTLE in order for it to be good. It’s DELICIOUS all by it’s lonesome! lol. Why do you discard the lovely roasted garlic? A huge thank you to everyone for your wonderful comments… and wishing you all a delicious Thanksgiving! I really love the thin slices of the butternut squash. I bet this make the squash even sweet when roasted. How gorgeous. Grubarazzi… You are so right about that! Ooh I’m loving the sage and garlic with the butternut squash. What a scrumptious combo. This recipe could not have come at a better time. I have a whole squash sitting on the counter right now. The way you’ve plated this is spectacular–and I love the use of sage in the dish. This sounds so delicious – nothing beats the flavor of roasted butternut squash. Your pictures are beautiful. 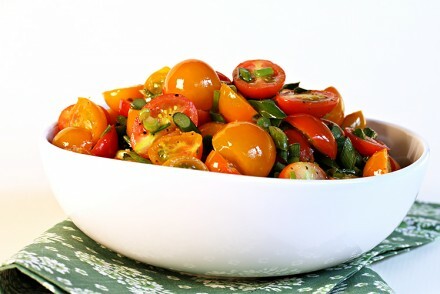 That looks gorgeous, healthy and incredibly flavorful. I love the presentation, too. 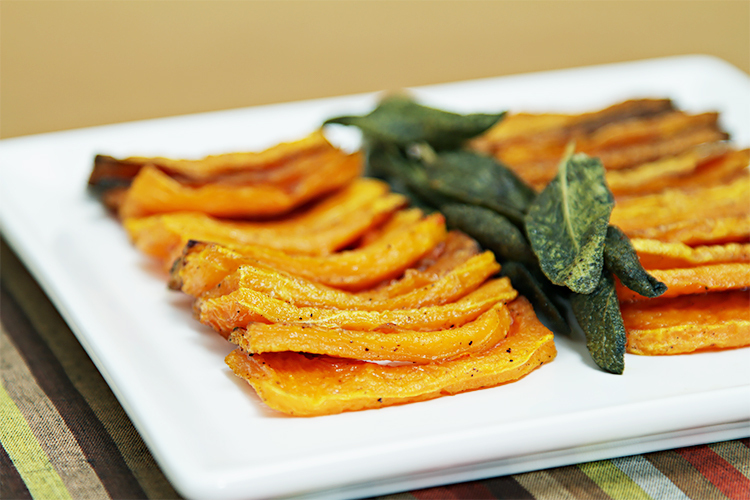 Butternut squash, garlic and sage – you can’t beat the combination! What a fabulous dish! These flavors are lovely together, and you’ve presented this beautifully! 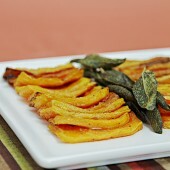 The slices of squash layered next to the sage leaves look great.